Marnie, Sarah and I shared “Opening Up: Starting the conversation with an Open Day” at TESS 2018. 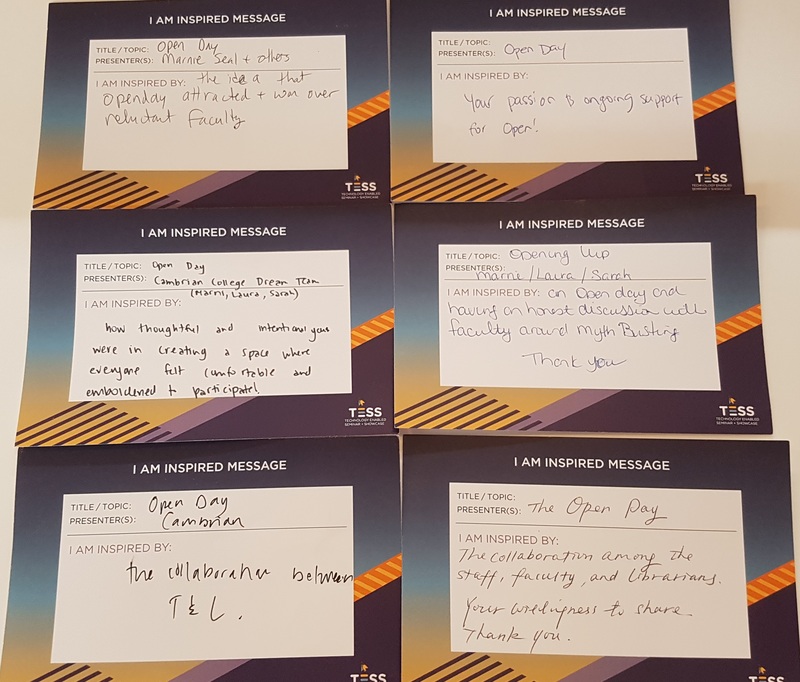 We reflected on key reasons why we held an Open Day, the planning and marketing strategies we used, our reflections on feedback received and how we are moving forward. Open day was only a success because it was a large team effort. Our presentation team was happy to represent an analysis of the work of the larger group. Thank you #TESS18 attendees. We appreciate your feedback that you found value in our resources. Kudos to @Cambrian_Jess @MarnieSeal @NurseKillam @melyoung00 @jennihayman and @joanne_kehoe. You are all equally part of this acknlowedgement of the work put into hosting Open Day. The backdrop for the presentation was this webpage, which was designed to be a take-home resource for anyone interested in adopting or remixing our materials or process. The website contains ready to use editable downloads (all open of course). Web pages are my favourite backdrop for presentations. They are, in my opinion, more useful than a PowerPoint for after the fact use by participants. We designed the webpage to be visually appealing, concise, and informative. Sarah tracked some statistics (I need to find out how to do that). In the two days following our presentation, the webpage received 97 views by 49 different people! Visitors spent an average of 4.7 minutes on the page. I was very pleased to hear that people were making use of the resource. During the presentation, we shared the direct URL to the page. Of the people that visited the webpage, 37 went directly to the URL, which means they got it during the presentation (or maybe on Twitter) as we had not listed the link elsewhere on our site. We didn’t count the exact number of people in the room during the presentation but would guess that there were around 40 to 50 people in the room, which means that it is likely that 80 to 90% of the audience visited the link. That is amazing! As you read through the webpage keep in mind that our success in attracting 166 attendees only happened because of strategic thinking, marketing and collaboration. Creating partnerships across an institution is absolutely key in attracting attendees and maintaining the interest of the community. We also put a lot of effort into getting the message about Open Day out there. We made sure people knew about the event and the food we were going to serve. As noted during the OEO summit blog, food attracts participants. Materials were strategically placed in the Hub, hand-delivered to faculty and communicated electronically. Personal invitations were also extended to several key stakeholders. We also made some very strategic decisions about what sessions to record and what audience to invite. Since we knew some faculty would feel most comfortable honestly discussing myths when the sessions were not recorded we did not stream or record the myth-busting session – and that was a good decision. It was also ideal to have eCampusOntario representation at these events. For more tips and reflections please visit the presentation site as well as this blog about feedback received from participants. Our presentation was more impactful than I thought. Now I realize that the people staring at their phones were likely perusing our website. During a presentation, it can be difficult as a presenter to “read the room.” We made an effort to engage the audience in some conversation but ended up doing a lot of talking … and of course, I omitted a few minor things I wanted to say (but they are on the website). Twitter chatter and some in-person conversations after the fact demonstrated to me that our messages resonated with people. It was really nice to have people approach me afterwards with questions about Open Day. Chatter about Open Day continued throughout the OEO summit as well as TESS. In fact, much to my surprise, we won an inspiration award! These awards were selected based on audience feedback, which was so nice to get. Hopefully, we get the chance to inspire more audiences by sharing our ongoing advocacy experiences at future events.